Are you interested in why organizations do employee performance evaluation? It's both an evaluative process and a communication tool. Done traditionally, employee performance evaluation is universally disliked by supervisors, managers, and employees. The managers hate employee reviews because they don't like to sit in judgment about an employee's work. They know that if the performance evaluation is less than stellar, they risk alienating the employee. At the same time, employees hate performance evaluation because they dislike being judged. They tend to take suggestions for performance improvement personally and negatively. Performance management, on the other hand, provides the advantages organizations seek in doing performance evaluation. But, performance management, participated effectively and with the appropriate mindset, accomplishes the same goals, and more. Performance management also supplies additional advantages to both the manager and the employee. The question on the table now is why organizations would want to ask employees to participate in either employee performance evaluation or a performance management system. Good reasons exist for advocating the basic concept of performance evaluation. There are few fans of the traditional process. In some form, most organizations have an overall plan for business success. The employee performance evaluation process, including goal setting, performance measurement, regular performance feedback, self-evaluation, employee recognition, and documentation of employee progress, ensures this success. The process, done with care and understanding, helps employees see how their jobs and expected contributions fit within the bigger picture of their organization. The more effective evaluation processes accomplish these goals and have additional benefits. Documented performance evaluations are communication tools that ensure the supervisor and her reporting staff members are clear about the requirements of each employee’s job. The evaluation also communicates the desired outcomes or outputs needed for each employee’s job and defines how they will be measured. 1. The employee and the supervisor are clear about the employee’s goals, required outcomes or outputs, and how the success of the contributions will be assessed. Your goal in employee evaluation is to motivate a high level of quality and quantity in the work that the employee produces. 2. The goals of the best employee performance evaluations also include employee development and organizational improvement. The employee performance evaluation helps employees accomplish both personal development and organizational goals. The act of writing down the goals takes the employee one step closer to accomplishing them. Since goals, deliverables, and measurements are negotiated in an effective employee performance evaluation, the employee and the supervisor are committed to achieving them. The written personal development goals are a commitment from the organization to assist the employee to grow in his or her career. 3. Employee performance evaluation provides legal, ethical, and visible evidence that employees were actively involved in understanding the requirements of their jobs and their performance. The accompanying goal setting, performance feedback, and documentation ensure that employees understand their required outputs. The goal of employee performance evaluation is to create accurate appraisal documentation to protect both the employee and the employer. In the event that an employee is not succeeding or improving his job performance, the performance evaluation documentation can be used to develop a Performance Improvement Plan (PIP). This plan provides more detailed goals with more frequent feedback to an employee who is struggling to perform. 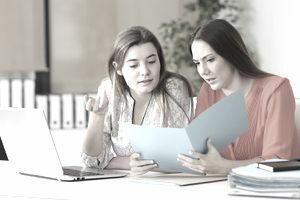 The goal of a PIP is the improvement of the employee's performance, but non-performance can lead to disciplinary action up to and including employment termination. 4. In many organizations, numeric rankings are used to compare an employee’s performance with the performance of other employees. Numeric ratings are frequent components of these systems, too. No matter how fair and non-discriminatory, these ratings are made to appear through the endless establishment of criteria for rating, and they boil down to the manager’s opinion of an employee’s performance. This is why numeric components in an employee performance evaluation process are not recommended.